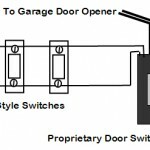 I recently lost a thirty year old Stanley garage door opener to a nearby lightning strike. I’ve fixed it several times in the past, but this time the micro-controller chip was fried. It was trying to open and close at the same time causing quite a fuss and overheating the motor. You can’t buy those chips any more, so out it goes. I did some research on what’s available for pickup at my local big-box retailers and found two predominate brands. Chamberlain and Genie. After looking at their specs, I chose the Chamberlain HD200 at Home Depot mainly because it offered all the same functions as my thirty year old Stanley for less than $100. I read the reviews and the biggest complaint was that it had a proprietary push button that would require me to purchase additional proprietary ones instead of using what was in my garage already. The old Stanley used simple door bell style buttons that would momentarily close the circuit when pressed. 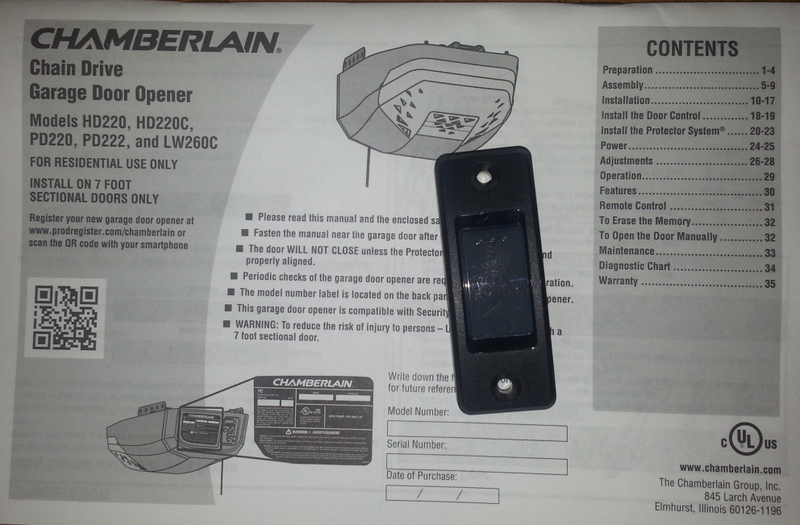 But now, no other push button except the proprietary Chamberlain would work with the new opener. I had an outdoor key-less number pad plus two push buttons – one near the garage door and one near the inside door to the rest of the house .And those would not work by just connecting them to the opener. I know a lot about electrical circuits and I knew that even the proprietary push button still had to have a regular push button inside it to activate the electronics. So I took the screws out and took out the circuit board by spreading the plastic clips slightly. Then I turned it over to look for the regular push button. Wow! Look at all those electronics to open a door! Now notice the highlighted area in the circle. That’s a miniature push button that gets pressed when you push the plastic cover’s button. There are two pairs of little metal connectors (like feet) on it that are soldered to the circuit board. Two of those feet get connected in the miniature switch whenever it is pressed – just like a regular switch. 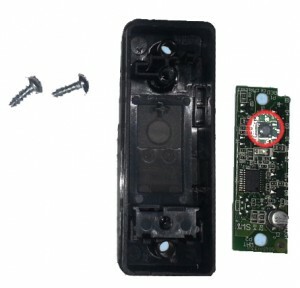 All I had to do was attach a wire pair to those two connector feet and any plain door bell type push button connected to that wire pair should do the same as if I hit the plastic cover’s button! 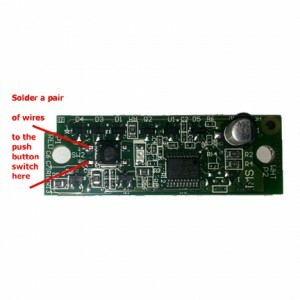 You’ll need a small tipped 15 watt soldering iron and some thin solder, plus a length of suitable new wire with two conductors. The new wire should be reasonably thin – AWG 20 or 24 because there is not a lot of current in this circuit and there’s not a lot of room in the plastic housing. The wire that comes with the new garage door opener is a bit too thick and not pliable enough to put the switch back together again with the extra new wire attached. Now solder the new wires to the two metal contact pins pointed to in the picture on the right. Then fold the wire out to one side of the circuit board and route it through the little cutout at the top of the switch’s plastic cover. Snap the circuit board in place and replace the two screws, but don’t tighten them just yet. 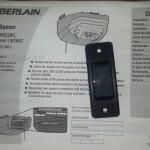 Ensure that the Chamberlain push button still clicks when you press the plastic cover button. 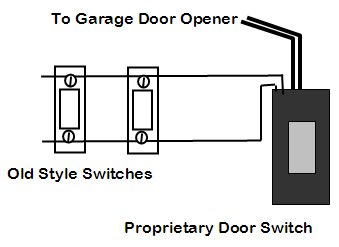 Now connect the wire that runs up to the garage door opener to the two screws as instructed by the Chamberlain installation manual. You can now mount Chamberlain’s switch anywhere you want. Then run the new wire that you added to your location of choice. Connec t the new wires that you added to any of your previous momentary push buttons. Make sure your old buttons do not have any electronics in them – just two contacts that close when you push it. Any additional old style push buttons are run in parallel, not series. In other words the pair of new wires connects to each one of the push buttons (like rungs on a ladder) in the circuit. If the new wires are run long distances, try to keep them from running near household electrical wires or they might pick up stray signals. This is an electrical circuit. Try not to zap it with static electricity when you handle the circuit board. Dry days are bad and humid days are good when trying to keep static away. Also, you should have some experience with a soldering iron as this is delicate circuitry and you could ruin the original Chamberlain push button. Try to make a small solder joint and not get any big blobs of solder on the other circuit lines.Do this by using a small tipped soldering iron and very thin solder. Strip only about 1/16″ of insulation from the end of the new wires and put a small dab of solder on each one. (This is called ‘tinning’ the wire’.) Then place the end of the wire on one of the little feet and touch it with just the tip of the iron long enough to melt the solder on the wire and the connector, ensuring a good strong connection. This should take about 5-15 seconds depending on the wattage of the iron. Make sure the new wire is in good shape and not shorted or broken. Like I mentioned, I’ve been working with electronics for a very long time. If you’re not comfortable with electrical circuits you should find someone who knows how to do this type of modification to an electrical circuit board. Yes, good point. Not all switches will be the same. Usually those tiny pushbutton switches make contact from 2 feet on one side to 2 feet on the other. Since they are usually square, they could easily be 90 degrees rotated from the ones in my post. Good catch. This was an awesome post ! I had no problem doing exactly as you described. Switches are at least $8.00 each! Being “lazy”, I had push button switches at all my doors until my old opener went bad.